Complete with a new leader, this Government remains in complete disarray — merely keeping the seat warm for Labor, writes Canberra correspondent John Passant. PETER DUTTON is one of the most powerful men in Cabinet. He runs Australia’s concentration camps on Manus Island and Nauru. He oversees the brutalisation of the people there, including denying the right of sick children to come to Australia for treatment. Dutton and the three governments he has been a member of since 2013 are slowly whittling away our freedoms under the guise of keeping Australians safe, of strong borders, of union thuggery, and assorted other lies they are using to disguise their anti-worker, pro-capital and anti-democratic agenda. We are becoming more regimented and controlled. For example, lawyer Bernard Collaery and Witness K are accused of conspiring to reveal secret information, by telling us about Australia’s illegal bugging of the Timor-Leste cabinet room. Much of the case is being held in secret. It is a crime to report on the bugging or to name Witness K.
The restrictions on the freedoms of building workers are already immense and this Government now wants to take away more of their rights. Australian Border Force officials already have wide seizure and inspection powers and now the Government wants to increase them. Conservatives have bullied nine-year-old Harper Nielson for pointing out that Australia’s national anthem is racist and not standing like an automaton when it is played. Just a few weeks ago, this monster came within three votes of becoming Australia’s prime minister. The man who vanquished him, Scott Morrison, used to run Australia’s concentration camps, before being promoted to Treasurer to run the economic deprivation of workers — and now on to the top political job of Prime Monster. The smell about Dutton will not disappear. He is quite possibly ineligible to sit in the Parliament and has been exposed for allegedly helping mates or wealthy Liberal supporters out with immigration matters, including two incidents involving au pairs. The Morrison Government will try to protect Dutton from referral to the High Court over his eligibility. A by-election, which Dutton would probably lose, would further undermine the Government’s hold on power.
.@JulieBishopMP has sent a message to her colleagues with a stack of papers brought into Question Time from voters lamenting her failure to be elevated to the leadership. @ljayes: She says she’s replying to each and everyone one them. Some Liberals, like Member for Curtin Julie Bishop, have hinted they might support a High Court referral motion from Labor in the House of Representatives. I suspect their loyalty to their gang of thieves is greater than their hatred of some of their political brothers. After all, they owe their political life to the Liberal Party and, in Bishop’s case, the potential of leading the rabble in Opposition might appeal. The Wentworth by-election on 20 October has the capacity, too, to undermine the Government. Former PM Malcolm Turnbull resigned from Parliament after losing the leadership. He won Wentworth in the 2016 Election with a primary vote of 62.3% and a two-party preferred vote of 67.7%. Because of a redistribution of the seat favourable to the Liberals, the ABC election site says the margin is now 18.9% to the Liberals, two-party preferred. David Sharma, a bog-standard Liberal Party man with the ability to bring in lots of money but, unlike many Liberal Party MPs and Senators, articulate and clever, won the pre-selection battle. He was Malcolm Turnbull’s candidate. Scott Morrison’s female candidate was knocked out in the third of six rounds. Now that Kerryn Phelps has announced she will run as an independent, it is entirely possible she, or Labor, could win the seat. Phelps has called on voters to put the Liberals last to send a message to the Government. Not only would a Phelps or Labor victory weaken the Government and take away its majority (though Phelps, if elected, would likely guarantee supply), it would send shock waves through the born-to-rule Liberal Party. It would also tell many voters that its okay not to vote for the Liberal rabble. One ex-PM sledging from New York. Another ex-PM nearly disendorsed by branch members. An attempted PM potentially ineligible to sit in Parliament. And an existing PM that can't explain why he's there. No one stood against Tony Abbott when he stood again for Liberal Party pre-selection for Warringah. He won, but the rumour mill has suggested there was sizeable opposition to him. Anti-Abbott forces say up to 40% of preselectors could have voted against him. His side denies it. The easy way to resolve this would be to release the vote but in a Party that says it wants to be open and democratic, neither side is pushing for that. This is the same Party that laughably argues it selects its candidates on merit, not gender. In other words, with just 20 per cent of Federal Liberal MPs and Senators being female, we can only conclude that men are much more meritorious than women. That appears to be the "logic" of their merit argument. 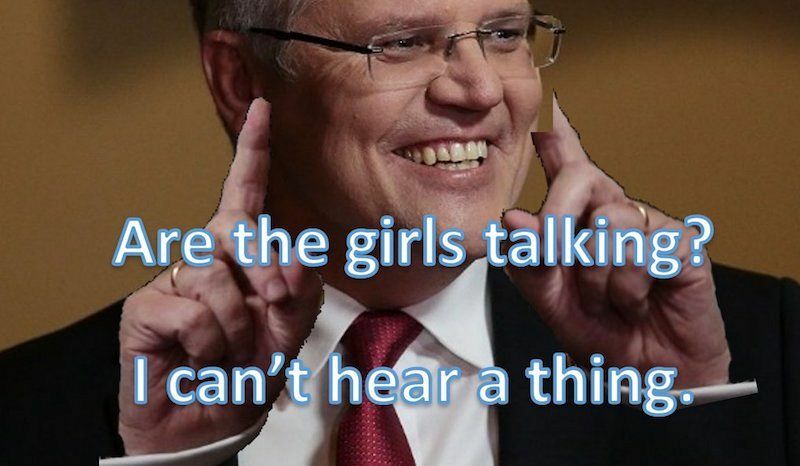 Maybe the real explanation is that the Liberal Party is a boys’ own club, with a few women who have fought their way up the ladder of Liberal "success". Some of those women, like Julia Banks, are abandoning the good ship Liberal Titanic. Ann Sudmalis might be joining her. A common theme to emerge over the last few weeks has been the bullying that a number of Liberal women have suffered. But those, like Lucy Gichuhi, who were going to name names have now fallen silent. Perhaps the bullies have bullied her and others into silence? Will they also gag Julie Bishop — especially if the bullying could, as Bishop put it, in some cases be illegal? Perhaps the Australian Federal Police are too busy chasing the CFMEU for being a good union to investigate the illegals in Parliament? This is a Government in complete disarray, merely keeping the seat warm for Labor. But let’s not get too carried away by that prospect. The ALP is committed to voting with the Government in supporting the Trans-Pacific Partnership Agreement. The divisions in the Party and unions run deep over this, as they do over a range of other issues. The differences over the best way to manage the slowing or declining Australian economy will challenge the Labor Party as much as they have challenged and are challenging the current government. The crisis in Australian politics is not going to disappear soon. That is the most embarrassing shite I have seen in a long time.